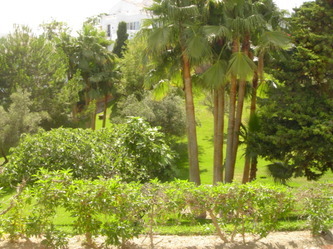 Villa Tetuan , all set in the beautiful award winning Oasis de Capistrano, Nerja. 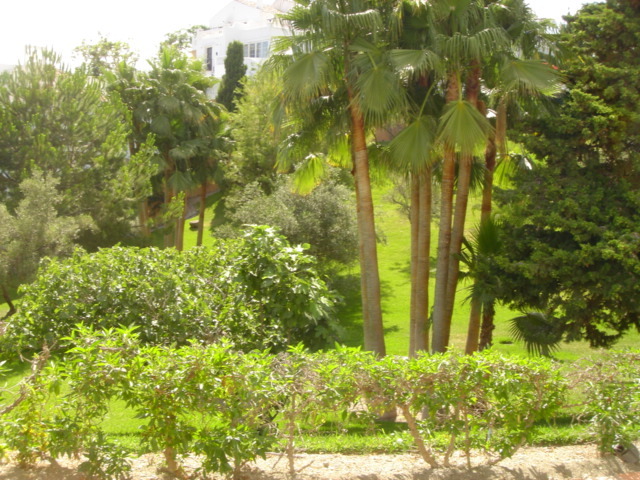 Burriana Beach and Nerja Town are just a short walk away. 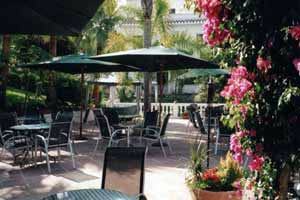 Oasis de Capistrano is a 7 acre private complex set in beautifully maintained gardens with palm trees, manicured lawns and many flowering shrubs and plants which are a riot of colour all year round. Spectacular mountain and sea views form a backdrop to the ancient Moorish aqueduct. 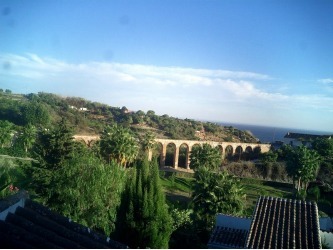 The sun rises over the Moorish Aqueduct, and gives early sunshine to the private terrace of both villas. 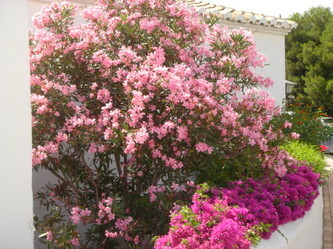 ​Both villas are south facing giving the benefit of all day sunshine. A perfect location for a family summer holiday or to catch some Spanish winter sun. Nerja town centre is a 15min walk, or you can take the bus which runs every half hour, so car-hire isn´t really needed unless you want to explore further afield. Burriana is the largest and most famous beach in the area, it is just a short distance away from our villas. It is almost the most commercial of all Nerja's beaches. Burriana beach, backed by an array of restaurants, bars and beach shops, is composed of a mixture of find sand and pebbles, making it easy to walk on. Palm umbrellas and sun-beds can be hired on the beach. Plenty of water sports and activities are offered including a Padi Dive centre which has introductory scuba courses and day cruises along the coast. the villas to visit whenever the mood takes you. 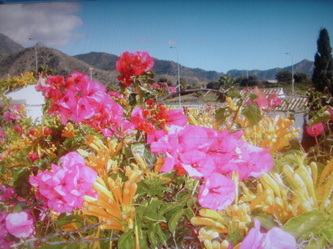 Nerja is situated in a tropical valley and has what is considered to be the best all year round climate in Europe. Due to its location, being sheltered by the Sierra Almijara mountain range to the north and having the warm sea to the south, Nerja enjoys an interesting micro-climate that tends to be sunnier and more temperate than that which is typical of the region. The Sierra Almijara mountain range provides a stunning backdrop to Nerja and make for an amazing contrast as they lead down to the sea. 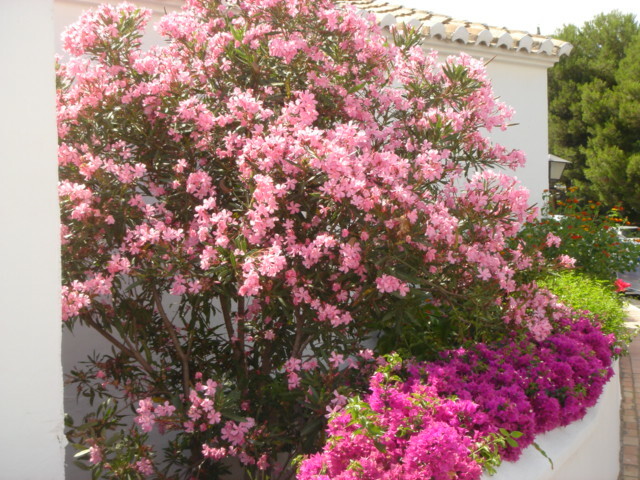 Nerja's close proximity to Granada and the Sierra Nevada Mountains gives you the luxury during the winter months of being able to sun yourself in the morning and ski in the afternoon - making Nerja's location even more unique! Capistrano and designed to show the villas excellent positionand making use of the lovely views over the Moorish Viaduct towards the sea and mountains. The villa enjoys all day sunshine. making it enjoyable and practical to use at any time of year. Our aim is for you to have a great holiday and enjoy yourselves. We look forward to hearing from you and will do our best to help you. 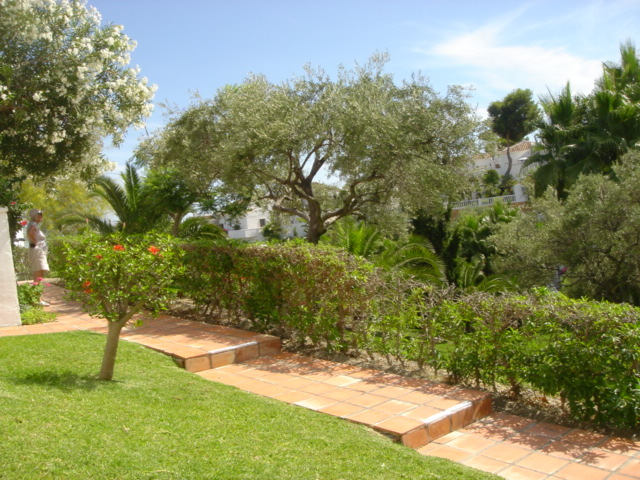 Lovely Oasis de Capistrano Gardens in Nerja with typical walkways down to the 3 pools and on site bar.